Christopher Columbus Bradley passed over to the Great Majority on January 29, 1916. He was the son of the original Christopher Columbus Bradley who was born in Groton, Tompkins County, N. Y., in 1800 and died in Syracuse in 1872. The first firm of Bradley was established in Syracuse in 1832 by Mr. Bradley's father. This was the first foundry and machine shop established in Syracuse. The Bradley family came to Groton just after the Revolutionary War and the first C. C. Bradley came to Syracuse some time prior to 1832. 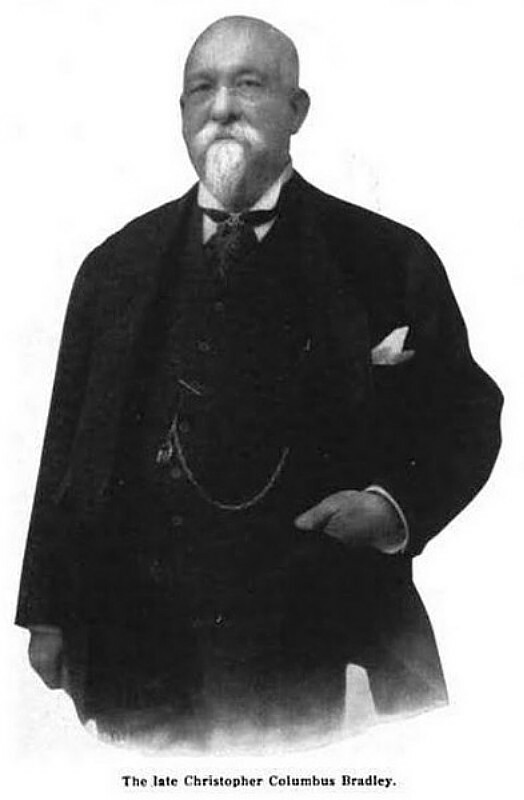 The first firm of Bradley ran under the name of C. C. Bradley. In 1855 the first C. C. Bradley took his sons Waterman C. Bradley and C. C. Bradley, Jr., into the firm under the title of C. C. Bradley & Sons. They did a general foundry business, all kinds of blacksmithing, made plows, scrapers and contractors' supplies, ran a machine and woodworking shop and made repairs of all kinds. In the sixties W. C. Bradley withdrew from the firm and removed to New York and the firm continued as C. C. Bradley & Son. The firm operated under the name of Bradley & Co. and The Bradley Co. at different times up to 1894, when the present firm of C. C. Bradley & Son, Inc., came into existence with the second and third C. C. Bradleys and Miss Cora M. Bradley as officers and directors. In the seventies the firm of C. C. Bradley & Son were large manufacturers of reapers, mowers, hay rakes, etc. C. C. Bradley, 2d, the subject of this sketch, was a mechanic of no mean ability as well as being a prolific inventor. He perfected the Bradley harvesting machinery. A Bradley reaper was the first machine of the kind to go to Russia. The firm gradually retired from the agricultural implement business and took up the manufacture of the Bradley cushioned power hammers. Mr. Bradley took out numerous patents on hammers and brought them to their present state of perfection. In the eighties the firm engaged in the wholesale carriage business and besides making some 50 or more styles of carriages and in quantities up to 5,000 jobs per year, they specialized on the Bradley two-wheeled jogging and village carts, traps, buckboards, etc. Mr. Bradley got out many improvements and took out many patents on horse-drawn vehicles and accessories. About 1890 there was brought to his attention a patent on a quick-shifting carriage shaft coupling whereby shafts and pole could be changed in 10 seconds and with no tools except the hands. This original patent of the cam lever device was taken out by William Henry Hannan and later purchased by C. C. Bradley & Son, Inc. Mr. Hannan's patent covered a straight-bearing coupling, and it was soon found that with this device the shafts had to be aligned perfectly otherwise the couplings would bind. Mr. Bradley set about to remedy this defect. He invented the present ball-bearing carriage shaft coupling which bears his name. The first ball-bearing couplings were made with a solid steel ball. These balls wore excessively, especially in a sandy country, and unless greased frequently would squeak. Mr. Bradley conceived the idea of reducing the size of the steel ball and surrounding it with a very hard pressed belt leather packing. This solved the problem of the squeak and excessive wear. It was demonstrated that the outside of the packing being of greater diameter than the inside, the leather did not move in the coupling, but the steel ball moved slightly in it. Mr. Bradley took out several patents in connection with this packing, including the retaining ring which kept the packing in place when changing the shafts or pole. Mr. Bradley invented the Bradley Holdfast coupler and many others, some of which were never put on the market. He probably took out at least 25 patents on carriage shaft couplers and spent a small fortune prosecuting infringers and defending his patents. “Imitation is the finest flattery is said, and if so Mr. Bradley must have been highly flattered by the imitations of his couplers. When he started in to make carriage couplers quick-shifting couplers were practically unknown. Mr. Bradley was a firm believer in advertising and never since he began making couplers for the carriage trade has the advertisement of the Bradley and Holdfast couplers been out of THE SPOKESMAN. The sales of Bradley and Hold fast couplers have run into the millions of pairs. Mr. Bradley was a stickler for quality and would make nothing but the best. He did not believe malleable iron was the proper material for his couplers, so he made them entirely of steel drop forgings, and they are still so made. Since Mr. Bradley started into make carriage shaft couplers he has gradually reduced the price until now it is 75 per cent less than it was originally and the quality is the highest. Mr. Bradley was a quiet man and loved his home more than anything else. He was a member of several clubs, but rarely went to them. Up to the time he became 75 years old he always had a stable full of horses, and they were the best he could find. Horses were his only amusement. He cared nothing for outdoor sports except driving and horse racing. He cared nothing for cards, billiards and indoor games. About six or seven years ago his doctor prescribed an automobile for him. He balked at this and said that was the last thing he ever wanted. He was finally persuaded to try one and finally became converted. He rode over 20,000 miles in his auto last year and never got more than 30 miles away from his home. Up to within a month of his death he had been in his car every day winter and summer for six years regardless of weather. Mr. Bradley was a member of the C. B. N. A. and had been for more than 30 years. Up to six or seven years ago he had attended every convention and was well known to practically all the members. Mr. Bradley was a fund of humor and always had the glad hand, a smile and a kind word for everyone. One of the prominent men of the carriage trade has passed away, but he will not be forgotten by anyone who ever knew him.